Midway Mania has a theme of playing carnival games involving scenes and characters from Toy Story, riders will wear 3-D glasses and shoot at virtual targets while also being able to see the virtual darts they are shooting. Using the latest in technology the games will be able to adjust in difficulty so that first timers and daily visitors will be able to have fun. Location: At the far back of Paradise Pier beneath the track of the California Screamin' roller coaster. Ride Capacity: 8 people per vehicle. Each vehicle consists of two cars that seat four people, with two rows per car. Wait Times: Expect to wait at least a half hour. Ride Access: The attraction has two special access ride vehicles set up for use from a wheelchair and they load from a special section so extra time can be taken. There are stairs at the ride exit, so anyone unable to use stairs will need to use the wheelchair vehicles as well. Wheelchair Transfer: Not required. ECV users will need to transfer to a standard wheelchair. Audio: Audio is used throughout the ride, but it can still be enjoyed without. Weight and Size Issues: The ride vehicles should comfortably accommodate all people. Height Restriction: Children must be able to sit upright on their own while on the attraction, they can not be held in a parent's lap. Other Issues: Movements during the ride are sudden and smaller children may slide around during them. When place between two parents the lap bar will not go down far enough to provide hold a child in place. Children may sit in an adult's lap. At this location: Much of the space taken up by the attraction was backstage area before cosntruction began, and much of the rest was empty space beneath the California Screamin' track. 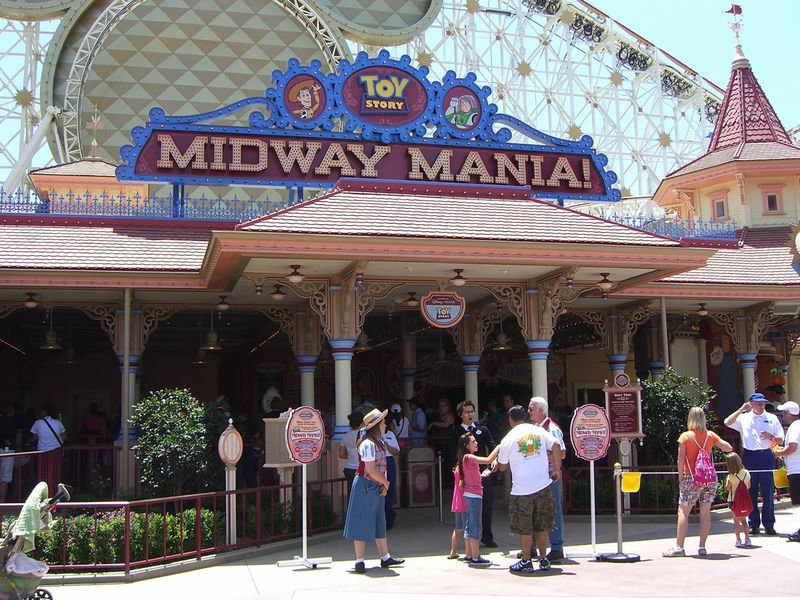 However, to provide access to the ride it was necessary to make changes to the "midway" section of Paradise Pier. Two dining locations were closed: Malibu-ritos was hardly missed since it was never really open. Strips, Dips 'n' Chips would have been missed however, but their menu was mostly moved to Bountiful Valley Farmer's Market, another never-open counter service restaurant that was revived by the move. A novelty photo store, Pacific Ocean Photos, was also lost to the need for space. A patent: Read the official patent filing for some of the technology powering the ride.